Sure, the Manhattan billionaire briefly made a half-hearted attempt to walk back some of his comments later, noting he was only talking about undocumented Mexican nationals and not Mexican Americans and their fellow citizens of Latino descent, but few inside L.A. or the broader nation’s Mexican American community believed him. To be honest, things only got worse. Over the past couple weeks Trump doubled down, promising not only to construct the ever-mythical border wall, but also to get the Mexican government to pay for it. Not to be outdone, fellow candidate Scotty Walker notified the nation of additional perils lurking to the North; he advocated for a wall to protect us from those drooling Canadian heathens. Though Walker’s attempt at riding Trump’s coattails seems simultaneously sad and hysterical, Trump’s comments remain far more detrimental. 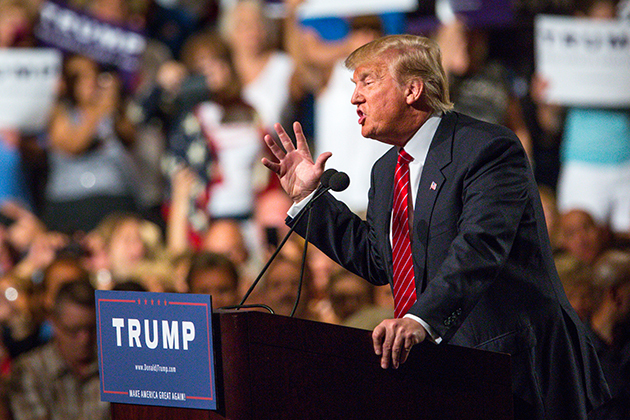 After all, several GOP candidates parroted his sentiments, thereby conveying a troubling discourse that in addition to being prejudiced ignores ethnic and regional difference within the Latino community. As demonstrated by University of California San Diego (UCSD) professor David Gutierrez in his now classic text “Walls and Mirrors,” historically, white Americans have not distinguished between Mexicans and Mexican Americans. “Generally defined by other Americans as Mexicans, despite the fact they were American citizens,” writes Gutierrez, “Mexican Americans’ own sense of distinctiveness was constantly reinforced by discriminatory treatment afforded them.”2 You can also assume many Americans do not distinguish between the various ethnic groups that the umbrella term Latino American includes. Sadly, none of this has stopped him from rocketing atop the polls in a crowded Republican field. Still, most commentators frame Trump’s stance on immigration in relation to the North American Free Trade Agreement (NAFTA) and the past decade of Latino demographic growth. While it is true that NAFTA has resulted, up until the past few years, in larger immigration flows from Mexico, the truth is Trump’s comments fit squarely into a long tradition, a full century in fact, of collective national schizophrenia that has swung between ambivalence and hostility toward Mexican migrant labor and Mexican Americans. Nearly 100 years ago, citrus industry officials, reformers, unions and politicians battled over Mexican immigration policies, while Mexican laborers found ways to exert their agency through union organizing, cultural protest, and settlement. Their battles contributed to the new multicultural, notably Chicano, face of twenty first century Southern California. With the Republican primaries on the horizon, the second GOP debate tonight, and Mr. Trump’s ham-fisted, prejudiced comments ringing in American ears, looking back at SoCal’s history provides a valuable tool for framing current and future immigration debates. 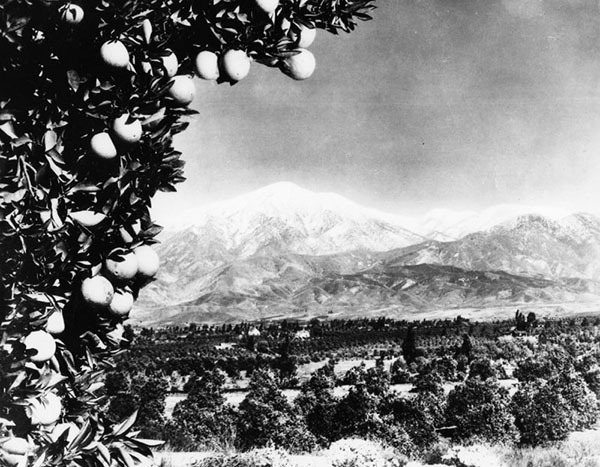 Citrus grove with Mount Baldy in the background. Photo courtesy of Los Angeles Public Library Photo Collection. Los Angeles post WWII urban and suburban development was very different from that of the east coast and Midwest because it was shaped largely by employment and industry instead of housing production. In “A World of its Own: Race, Labor, and Citrus in the Making of Greater Los Angeles, 1900-1970”, historian Matt Garcia places the citrus industry and the hundreds of thousands of Mexicans and Mexican Americans that labored within in it at the center of Southern California development. Citrus industry profits built large swaths of Southern California and the largely Mexican workforce occupied a central place in the development of Los Angeles, San Gabriel Valley and Riverside County communities like Pasadena, Ontario, Glendora, El Monte, and Claremont. The “polynuclear” or radial urban suburbanization that defines Los Angeles, Orange County, and San Gabriel Valley arose first as result of the sweet and sour profits resulting from the picking of oranges and lemons. The larger point here is that Mexican labor fueled the profits of corporate citrus agriculture in SoCal and enabled for a growing white middle class employed in managerial positions along with working class Midwestern and Southern migrants to construct their own lives in the Southland. At the same time, Mexicans, despite segregation, established roots throughout the region, shaping it culturally and demographically. Hicks Camp in El Monte was one of many Mexican colonias along the Southern Pacific railroad. Photo courtesy of La Historia Society. One would think that the contributions of Mexican laborers to California and elsewhere would receive more praise than condemnation. However, the fact is that even supporters of immigration portrayed Mexican families and workers in demeaning terms. During the 1920s, head of the Los Angeles Chamber of Commerce (LACC), George P. Clements favored increased immigration of labor from south of the border, but described Mexicans in less than flattering, eugenic terms. What anti-restrictionists, as they were called, did not expect, was that the citrus industry provided nearly year-round employment for Mexican laborers that managed to lay down their roots and purchase homes. Economist Paul Taylor found higher rates of homeownership than expected in Azusa, Claremont, Covina, El Monte, La Verne, La Puente, Pasadena, Pomona, San Dimas and Upland colonias. Wanting to spare their families a transient existence, parents made sure to save their pennies for a $300 to $500 down payment on a home even “when you think they haven’t a cent,” wrote Taylor. 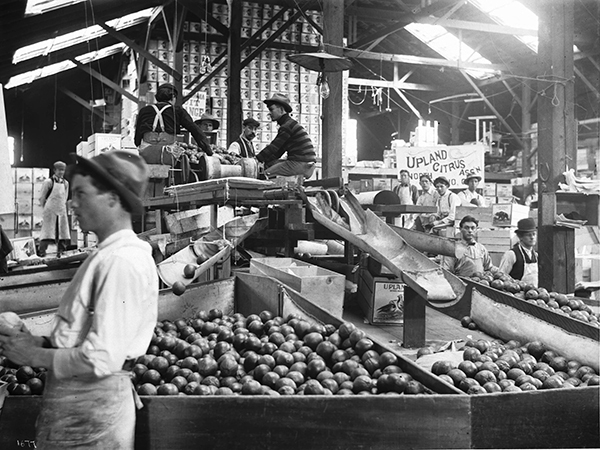 Interior of citrus packing house in Ontario, CA. Photo courtesy of Wikimedia Commons. As result of the nativist rhetoric, the California Fruit Growers Exchange (CFGE), more commonly referred to as Sunkist, and other citrus growers adopted Americanization programs for their workers. Amanda Mathews Chase, the first Americanization homeworker in Los Angeles suggested Mexicans needed “an education of a peculiar sort – education that shall be a disciplinary tonic – that shall give them standards – that amounts to evolution.” Others like CFGE administrator George Hodgkin simply wanted to equip them with the necessary skills to create a “satisfactory supply of labor to do good work at the lowest cost.” Many believed that Mexicans were susceptible to the baser pleasures in life. “The chief enemy of the Mexican laborer is whiskey,” argued California Citrograph writer and labor expert, Archibald Shamel. 8 Clearly, none of this is exactly “Mr. Holland’s Opus.” In the end, growers only embraced such programs because they believed it ensured a more organized, attentive, and economical labor force. Mexican families responded to such attempts with their own cultural projects. In the Claremont colonias of Arbol Verde and La Colonia, residents established a market and local cooperative they called Cooperativa which supplied families with “unique spices, vegetables, and cuts of meat necessary for making Mexican dishes” and enabled families to buy staples like flour and corn in bulk to save costs. Long time resident Mario Serna who helped run the Co-op later converted part of his home into what became known as El Chisme or “the gossip market” thereby providing another space for communal gatherings. Numerous other colonias established similar institutions. When their children returned home from their segregated schools in Upland, Claremont, and Ontario, parents took them to the local colonia school known as “Leona Viscario,” where younger charges practiced reading and writing in Spanish while their older counterparts poured over Mexican history, sang folk songs, or drafted compositions in Spanish. It even extended into community entertainment. “Occasionally, the teachers and parents organized plays based on Mexican history and culture that they performed before adult residents,” notes Garcia. Sports, notably baseball, also provided Mexican workers with an avenue toward community. As part of the Americanization program, CFGE and other growers encouraged their workers to play baseball. “In order to produce the desired workers, they have to become a member of a local society or baseball team,” Sunkist Industrial Relations director Hodgkin told his fellow growers in 1921. Baseball, he argued, would “increase their physical and mental capacity for work.” Mexican workers embraced the sport but used it to create bonds across the state and promote unionization efforts and political agency.9 For example, squads like the Juveniles represented Claremont and the Merchants, La Verne.10 In general, CFGE and others tended to provide services for pragmatic rather than idealistic reasons. World War II ushered in a new need for labor and the Bracero Program brought hundreds of thousands of guest workers and future Mexican Americans to the nation. In its first five years, nearly 225,000 guest workers had labored in the U.S. and 57 percent of them in California. 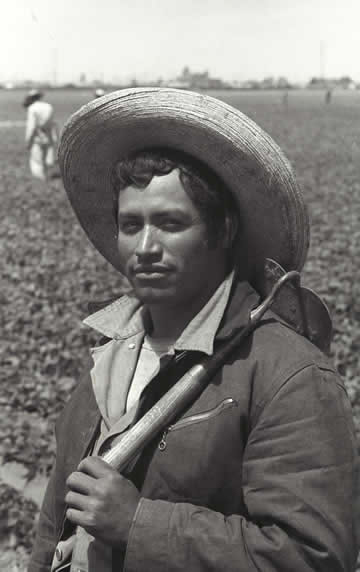 In fact, no state absorbed more braceros than California and some estimates suggested that by 1946 they represented 80 percent of all California pickers. Meant to be temporary, the program lasted over twenty years and caused no small amount of anxiety and intraethnic conflict for Mexicans and Mexican Americans. Mired in a segregated economy that afforded them few options, some Mexican Americans viewed braceros as unfair competition for employment and in some cases for possible mates, as occasional conflicts over love interests arose. The Bracero Program brought thousands of future citizens into the United States and built on the accomplishments of Mexican citrus workers decades before its passage. It coincided with Southern California’s industrialization, which displaced citrus farming and resulted in a growing need for housing. Citrus growers saw dollar signs in selling to developers particularly as the necessary conditions for orange and lemon harvests declined inversely with industry’s expansion. Beginning with World War II and spanning over the course of three decades the citrus belt was transformed into the suburbanized housing subdivisions recognized as today’s modern Southern California. Industry incorporated Mexican Americans, though hardly on equal terms as many former field labors took work in lower level positions that held little promise for promotion. Yet in the process, Mexican American culture blossomed as evidenced by the sounds of interracial dances at Pomona’s Rainbow Gardens and concerts at El Monte’s American Legion Stadium. “Los Angeles is widely acknowledged to have become strikingly more cosmopolitan in recent years,” wrote New York Times journalist Alex Williams this past May. Williams documented the city’s new magnetic pull that now draws incredulous New Yorkers to its environs, where in previous decades Manhattan socialites and Brooklyn hipsters scoffed. Granted the article seemed overly enamored of white creative types; see Highland Park in the 1960s, Judith Baca’s Great Wall of Los Angeles completed in 1984, and countless other examples of artists of color inhabiting and shaping the city. Williams unintentionally pointed to an underlying fact: 21st century Los Angles built on the labor and culture of its 20th century residents, notably its Asian and Mexican workers is the place to be. 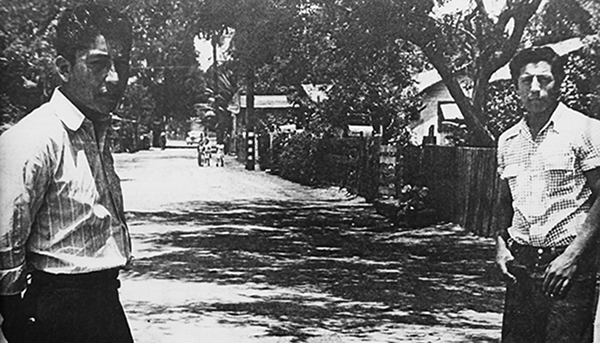 The truth is, Los Angeles and its surrounding communities have long consisted of a multiracial cast of characters. It seems no coincidence that its new apparent status coincides with the demographic ascension of its Latino and particularly its Mexican American population. San Gabriel Valley, notes Wendy Cheng, has emerged as a standard bearer of multicultural suburbia and San Fernando Valley as Michan Connor tells us now, represents the interests of Latino Americans as much as its once stereotypical white population. Trump and other Republicans might bemoan the nation’s burgeoning Latino, particularly its Mexican demographics, but judging from Los Angeles and Southern California, things couldn’t be much better. 1 Javier Panzar, “It’s official: Latinos now outnumber whites in California,” Los Angeles Times, July 8, 2015, http://www.latimes.com/local/california/la-me-census-latinos-20150708-story.html. 2 David Gutierrez, Walls and Mirrors: Mexican Americans, Mexican Immigrants and the Politics of Ethnicity, (Los Angeles: University of California Press, 1995), 7. 3 Barraclough, Making the San Fernando Valley, 54. 4 Garcia, A World of its Own, 19, 109, 119. 5 Garcia, A World of its Own, 25-26, 101. 6 Garcia, A World of its Own, 60. 8 Garcia, A World of its Own, 66. 9 Jose M. Alamillo, “Peloteros in Paradise: Mexican American Baseball and Oppositional Politics in Southern California, 1930-1950”, Western Historical Quarterly 34 (Summer 2003),193, 198. 10 Garcia, A World of its Own, 73. 11 Gutierrez, Walls and Mirrors, 54. 12 Gutierrez, Walls and Mirrors, 54. 13 Garcia, A World of its Own, 92. 14 Gutierrez, Walls and Mirrors, 134. 15 Garcia, A World of its Own, 175. A version of this article originally appeared at KCET Departures under its Intersections column in August 2015. Thank you for the great article Ryan Reft! !